Organization will make or break a person. Getting organized allows us to get more done, be less-stressed, and work smarter, not harder. Becoming an organized person who plans things out isn't easy, but it is possible. 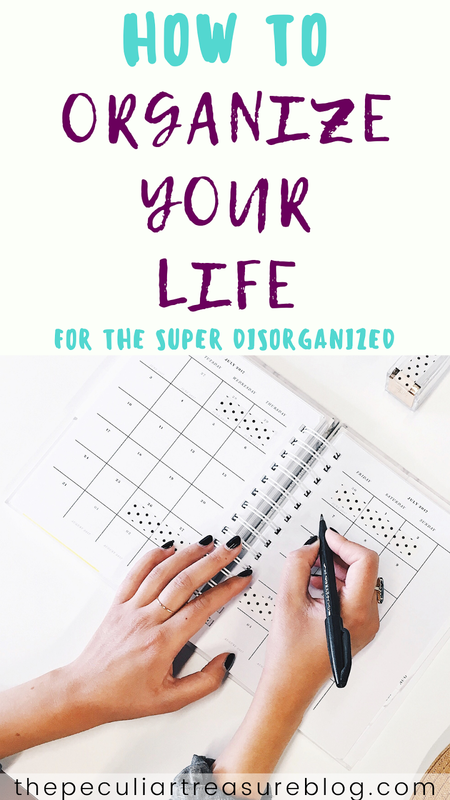 Learn how to organize your life today, even if you are a naturally disorganized person. If you are anything like me, you probably feel the pains of disorganization far too often. You try to keep everything in order, but there's always a set of keys, a pair of sunglasses, or your favorite pair of jeans that have just vanished into thin air. Perhaps the jeans were in the pile of laundry you threw in the spare bedroom when that guest showed up unannounced. Or maybe your sunglasses got tossed into the backseat of your car- along with that paperwork that you threw over your shoulder. Honestly, I can't help you there. I can't help you find your jeans or keep you from throwing stuff hastily into the back of your car. I can't help you because I do it too and don't have any answers as to how to fix it, other than to just stop doing those things - easier said than done, right? But what I can do is give you some ideas as to how to get more organized in general. I can help you get creative with organization, and I can also help you learn to organize your to-do list. 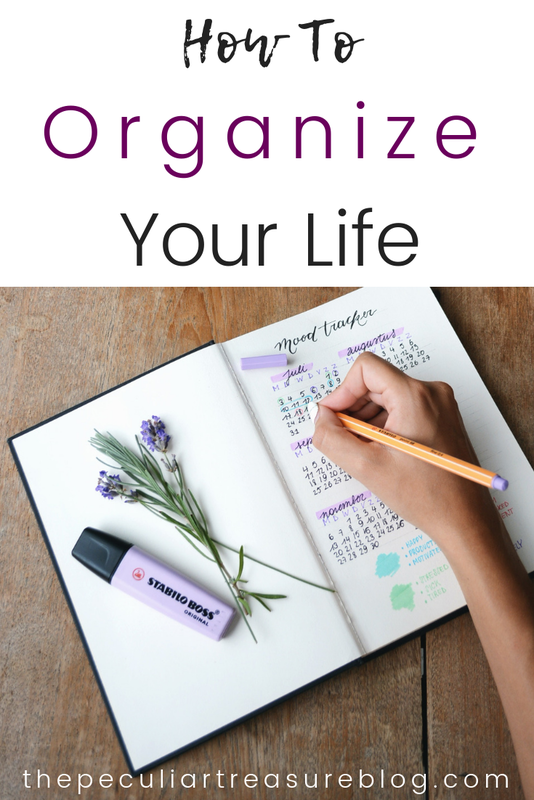 I can help you with organizing the big tasks, appointments, and agendas of your day- so that you aren't quite as frazzled, and maybe won't be so disorganized with the little stuff. Think you could use the help? Keep reading to learn more. Have you ever seen pictures of those perfectly put-together homes on Pinterest that make you feel 100% like an inadequate house keeper? Chances are, you have. But the thing is, all of those people who have "perfect" homes all have one thing in common: they take the time to organize and properly store their stuff. I am so bad about throwing things in the nearest chair when I am done with it instead of putting it away, but that's exactly how a house goes from Pinterest-worthy to disastrous in one fell swoop. It really doesn't take much effort to put our paper work in a nice accordion folder like this one, to hang our jackets in the closet, or to store our unused blankets in a cute, stylish basket beside the couch. Trust me, it's way easier to keep your house looking nice and inviting when you stay on top of the little things and decide to be a little more organized. One of the main reasons life gets in such disarray for me is that I allow myself to procrastinate so often. It's nearly impossible to have an organized life when I put my to-do list on the back-burner to do other things. I often find myself making excuses about why I procrastinated, but at the end of the day, it really doesn't matter what my excuse is - procrastinating still keeps me less organized and more stressed. So take it from a chronic procrastinator: instead of always using the "It was a special occasion" excuse, push yourself to take care of your to-do list on time, whether you feel like it or not. Self-discipline is not easy, especially when you aren't used to disciplining yourself at all, but if you refuse to reject procrastination, you will never have a truly organized life. I cannot function if I don't write my to-do list down. If I don't write everything down that I need to do each day, it will not get done. I will forget no matter how important the task, and then I will also forget the following day because, guess what: it's not in my planner to look back at! So what's a chronic forgetter like me supposed to do? Enter my magical helper: The Happy Planner! The thing I love most about The Happy Planner is that there are three blocked sections for each day of the week. There is plenty of space, but it is also great for organizing the different facets of my day. I use each block within the column for something separate. In Block #1, I list all of my blog and VA tasks of the day. Anything from writing a new blog post, checking on Google Analytics, or scheduling out pins for a client will go in this first block. In the second block, I list any and all blog groups I've participated in that day, and what I need to do to fulfill that group's requirements. So if I have participated in a thread in Blog Passion Project (a blog group I am an admin in), I list the group name and the names of the threads I participated in. This helps me stay on top of fulfilling the requirements of each group I interacted with. In the third block, I list anything personal and non-bog related. Anything from mopping the floors, babysitting for a friend, calling a family member, or a reminder that it's Bible study day at church gets put in block #3. 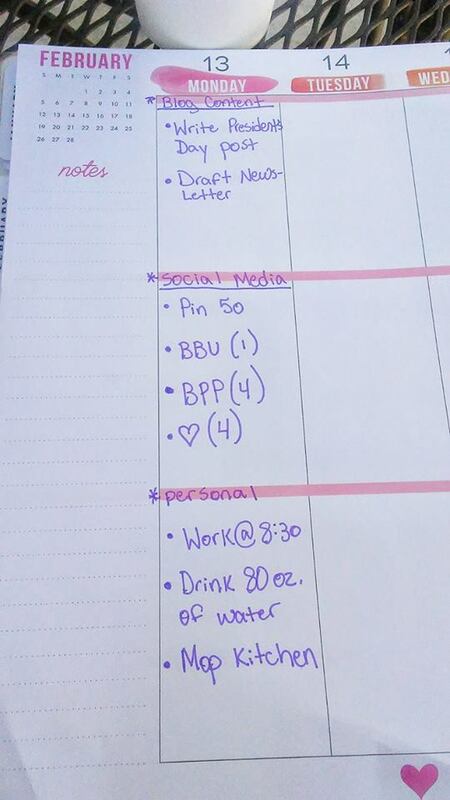 Setting my planner up like this has been so helpful for me because it enables me to see all my tasks for the day listed in one, easy-to read column, while still being organized by the type of task it is. 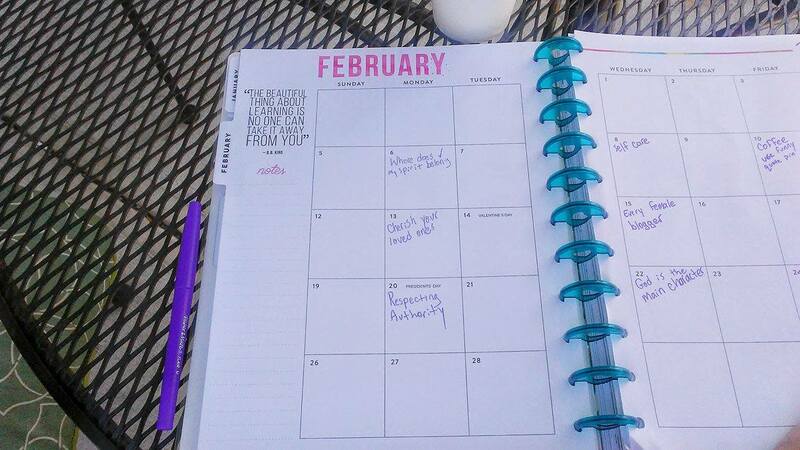 Another thing I use The Happy Planner for is to organize my content for the month. Okay, well actually I should rephrase that: I am trying to get into the habit of organizing my content of the month. I'm not very good at sticking to that yet. But anywho, since the monthly calendar is big enough to jot down the name of a post I am wanting to write, I just use that as my "content calendar". All this means is that after a brainstorming session for upcoming posts, I go to the monthly calendar and pick what dates would be best for each post. This can be especially helpful during the holiday seasons when you want to make sure you start promoting holiday content early enough, or for making sure you plan a series of post for the right days. The Happy Planner also has an inspiring quote on the monthly calendar and some fun extras like monthly goal-setting sections, monthly birthday sections, and a "things I'm loving this month" section. (shown below). The thing that makes me think that The Happy Planner would be great for pretty much anyone, is that it is completely customizable. You can have a large planner (like mine), a medium-sized planner, or even a miniature planner. 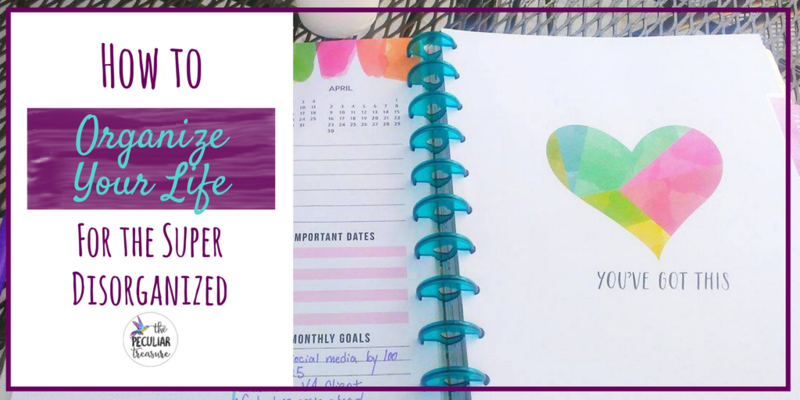 You can pick your cover, you can buy extra inserts to extend your calendar, you can buy budgeting inserts, pretty stickers, fitness planners, or bulk packages with The Happy Planner smorgasbord! 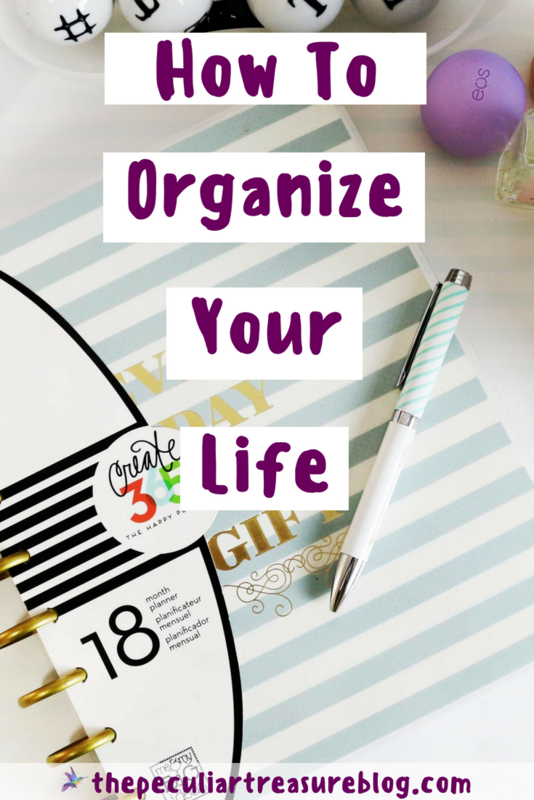 I really hope these three tips have encouraged you to get more organized this year. It might not be easy at first, but you can do it. Take the steps towards getting organized so that you will feel less stressed and more ready to tackle each day with joy. And most importantly, keep on being your peculiar self. Need more tips for organization? Check out the posts below by some awesome ladies that I am teaming up with! Do you have one too? I really love it! I love being organized, writing to-to lists and planning my days. I will definitely check The Happy Planner. Thank you for the inspiration! 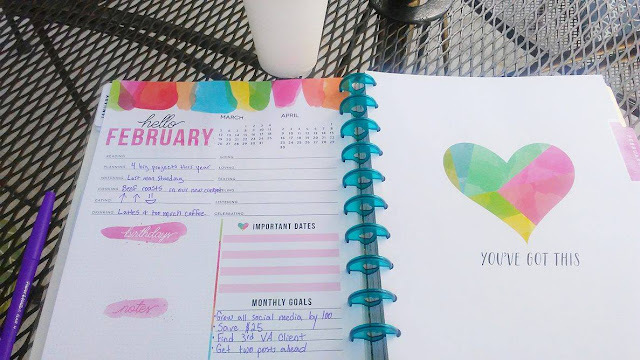 I love my happy planner-- it keeps me so organized and I love the disc bound system which allows me to move things around easier! I love planners!! This one is so cute and I love the bright happy colors. I also like how you utilized the blocks. Very helpful. If I didn't already have a planner for this year, I would have considered getting this one. Thanks for sharing! I FINALLY got a planner and it's been such a game changer. I can keep track of my blogging homework assignments, blog posts and even chores around the house. Great stuff, you always have good ideas! I need to organize my blog prep a lot better. I don't have a planner, but might just have to add it to my list of things to buy. You were one of the ones who recommended this planner to me in the BBP and I purchased it. So glad I did because i love it!! I'm still playing around with the best way to organize everything in it but it provides a lot of options. I like seeing how other people organize their lives and use their planners - I feel like I always get such good ideas on how to tweak my own planner! I never use the monthly calendar in my planner but using it for blog content planning is excellent advice! Thanks! That's about the only thing I use it for- other than big events. I love planners. They make life sooo much easier! I'm one of those people who HAS to write everything down or I'll go crazy. I know! I have to as well! I will not remember if I don't take the time to write it down. This looks like a great planner. Sometimes planners have so much going on that they are overwhelming and I end up not using it. But I think I could get behind this one. This one is certainly bright, but I feel like it is organized well so it balances out. I've been thinking about getting a planner, but I'm afraid that I will feel like I failed if I don't complete my scheduled activities. Start small! I miss a lot of my tasks honestly. It's more about having it written down so you know what you need to be doing. If some tasks have to be left for the next day (as long as they aren't super time sensitive) that's totally ok.
You should check it out for sure! You made your own! That's awesome! Are you planning a post about that? Maybeeee! ;-) It's too soon to say TBH! I did a big share of it on Insta-stories the first week in January! 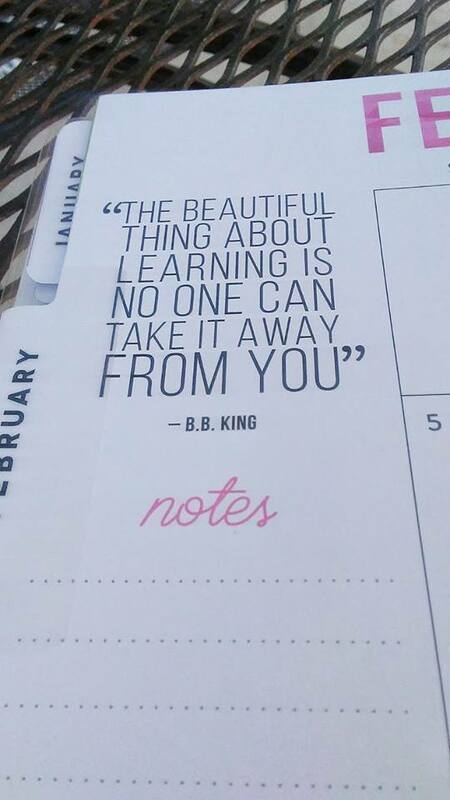 I love my planner! Writing things down is definitely key to staying on top of everything that needs to get done in a day! This planner looks like so much fun! I've been slacking with physical planners lately! Yes yes yes!! Planners are seriously the best, and I think that the Happy Planners are super cute! I love this. I bought the Brilliant Life Planner this year (happy birthday to me!) and it's been super helpful but honestly I kind of like the look of this more. Does it have a scheduling section or just the block section? I can't decide which is more practical for me! I've seen quite a few people recommend this planner now! I tried a Plum Paper Planner for the first time this year and I'm obsessed! Awesome idea! Definitely need some help in the time management department sometimes. Thanks for the idea! The monthly spread in that planner is just perfect! Most I see just have the calendar written into it. I love seeing how other people stay organized, and the weekly view with your personal, blog, etc... sections gave me such an "a-ha" moment! I don't know why I don't organize each day like that! I'm overall a very organized person, but I have been struggling to keep tasks straight or meet my personal deadlines. 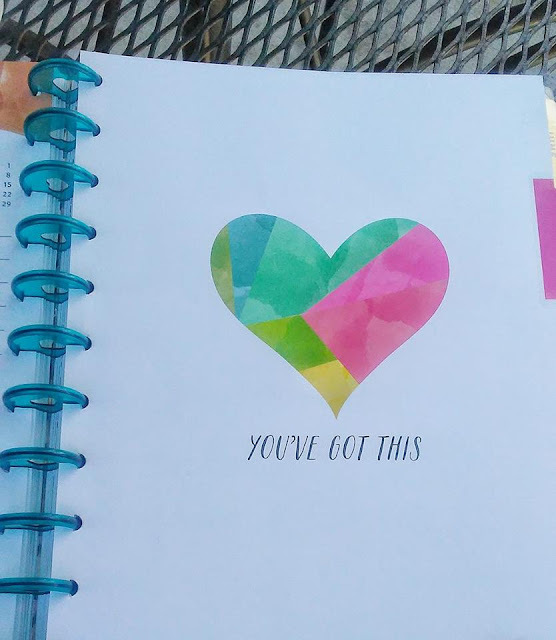 LOVE this little Happy Planner! Definitely checking it out!